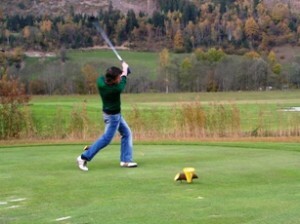 Also summer time offers a lot of possibilities for unprecedented holiday pleasure. 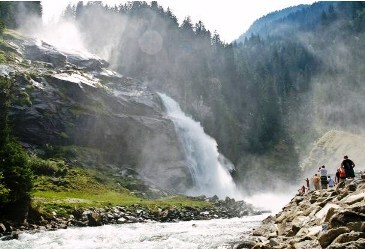 The place of interest of Krimml are of course the Krimml Waterfalls; these are the highest waterfalls of Europe, falling down in three stages. See the website of Krimml. Many walks are set in the unbelievable beautiful nature of the National Park Hohe Tauern. Behind the famous Krimml Waterfalls, you will find the vast Achental that you can reach by taxi bus. As from here you can make endless mountain trips including a so called “Hüttentocht”. With the help of a professional guide you can participate in Nordic Walking trips and you can make beautiful mountain walks. 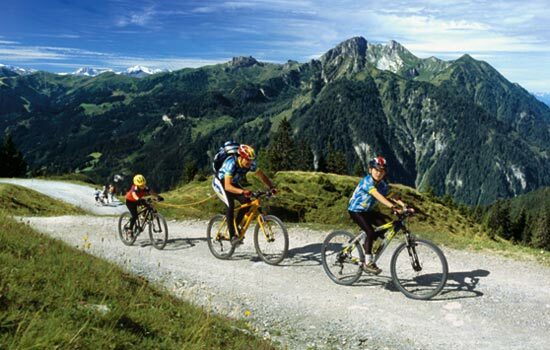 Sport freaks can enjoy mountain king and paragliding. Gerlos will offer you the possibility, via Berg Aktiv or Teeny Action, to participate in rafting, mountain climbing, “hochseilgarten” and canoeing. The reservoir near Gerlos is recommended: you can pedal boat, sail and fish. In Wald you will find the “Kristallbad” and in Hollersbach a nice open air swimming pool (allowing you to swim and to sail with small inflatable boats). You can rent tennis-courts in Hochkrimml (Gasthof Filzstein), in Krimml, Gerlos (also indoor tennis-courts) and in Hollersbach. Toboggan-pleasure can be experienced on the firs toboggan field of the Zillertal, an attraction for young and old. Both during summer and wintertime the toboggan field is a 1.450 m adventure with its many curves and waves. You can find the start near the valley-station of the Zillertal Arena in Zell am Ziller.